New Zealand is renowned for its wondrous scenery, and among the country's top tourist attractions are two glaciers that are both stunning and unusual. They snake down from the mountains to a temperate rain forest. It's made them easy for people to walk up to and view. But the Fox and Franz Josef glaciers have been melting at a rapid rate. Now it has become too dangerous for tourists to hike onto them from the valley floor. It has ended a tradition that dates back a century. With continuing warm weather this year, there are no signs of a turnaround. Scientists say it is another example of how global warming is impacting the environment. Tourism in New Zealand is booming. Nearly 1 million people last year flocked to get a glimpse of the glaciers. In addition, the glaciers have carved out spectacular valleys. But the only way to set foot on them now is to get flown onto them by helicopter. Tour operators offer flights and guided glacier walks. But logistics limit this to 80,000 tourists per year. It's half the number that once hiked up from the valley floor. Up to another 150,000 each year take scenic flights. They land briefly at the top of the glaciers. Flying in the UNESCO World Heritage area comes with its own risks. In November, a sightseeing helicopter crashed onto the Fox Glacier. All seven aboard died. Wayne Costello is a district operations manager for the Department of Conservation. He said that when he arrived eight years ago, the rock he now was perched on would have been buried under tons of ice. Instead, the glacier now comes to an end a half-mile further up the valley. "It's wasted away in terms of its thickness," Costello said. "And that's led to quite a rapid melt." A 2014 paper was published in the journal Global and Planetary Change. The paper concluded the two glaciers have each melted by 1.9 miles in length. It has melted since the 1800s. Today, the glaciers are about 20 percent shorter. Recently, they have melted at a faster pace than ever previously recorded, the authors said. The hot weather has even created a new type of tourist attraction over the other side of the mountains. Purdie said the glaciers there are also rapidly retreating. It has resulted in tourists taking boat rides on the lakes to see some of the massive icebergs that have begun to shear away. A helicopter trip onto the Fox Glacier reveals deep crevasses in the translucent blue ice. Stunning ice caves also can be seen, through which guides take crampon-wearing tourists. "It makes me a little bit sad. Because you see how fast everything is going," she said. New Zealand's massive glaciers are a marvelous spot for people to ski and look at the sites for many tourist around the world but with the glaciers melting it may affect more than just the tourist.New Zealand probably makes thousands of dollars from tourism in there country alone but with the glaciers melting it limits the amount of tourist that can come in a year and even then it would be hard for the tourist to do anything wit so many dangerous slopes nearby.These sudden declines in tourism could lead to a big loss in the New Zealand economy and problems in the future many places similar to it. The glaciers could fall and destroy some houses in New Zealand. It helps there economy because it attractes tourist but is do not help because they can not really get rid of it. It has huge of impact because its a lot of animal habitats. Also, because they are a good exhibit for tourist to look at. what i think about the article is that the glaciers are melting and some people think that its OK just to go there and explore but when they get there it will just be a big pond full of water. New Zealand's glaciers had been melting which people might have not been able to hike up to the glaciers because the glaciers had been making the hiking to be dangerous which people won't be able to look up close to the glaciers. The people might have not been able to hike up to glaciers because the melting glaciers had been making the hiking to be dangerous with rocks falling over. 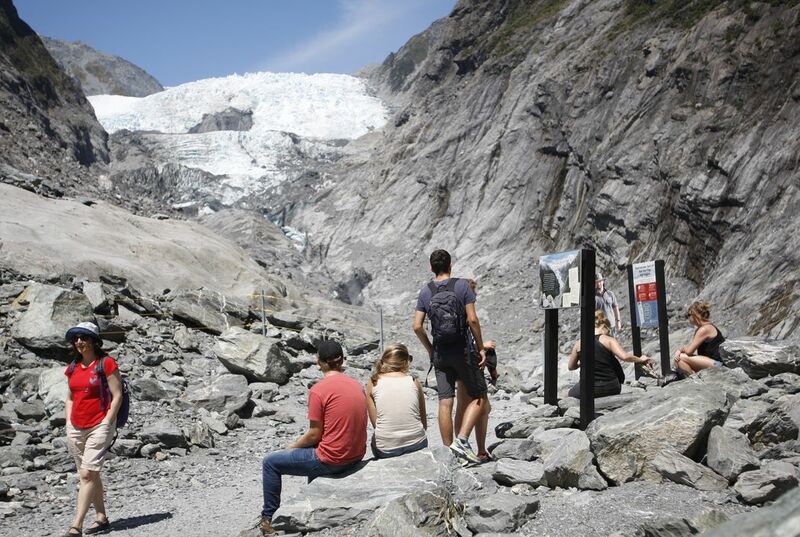 The rapid melting of the glaciers might have gotten the hiking to be too dangerous for hikers to be hiking which put the end of hiking up to the glaciers which people won't hike up to the glaciers. The glaciers might have gotten the hike up the glaciers which wouldn't make the hikers to be far away from the melting glaciers from the mountain. Critical Thinking Question: What impact do the glaciers have on New Zealand's economy? Answer: I know the impact that the glaciers have on New Zealand's economy because the glaciers had been a popular attract to tourist in New Zealand. The impact that the glaciers have on New Zealand's economy is the tourist attraction rate. The melting ice positively and negatively affects the tourist population, there in New Zealand. 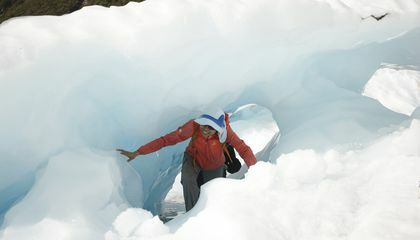 Tourists are going to New Zealand to see the beautiful ice caves and take helicopter rides to see the ice melting. Tourists are even taking boat rides on the lake made by the melted ice. It says in the article,"The hot weather has even created a new type of tourist attraction over the other side of the mountains. Purdie said the glaciers there are also rapidly retreating. It has resulted in tourists taking boat rides on the lakes to see some of the massive icebergs that have begun to shear away." The text is saying how the glaciers positively effect the tourist population and how the ice melting is being benefited from. The ice also has a negative affect on the land because the once beautiful glaciers have now melted away and are causing the sea levels to rise, making less coast lines and beaches. What I thought about this article was that it was great and it was very interesting to me! The glaciers in New Zealand’s economy attract many tourist who love to see these magnificent glaciers as said in this article. My opinion on this is that I am not planing on seeing this "amazing site".These glaciers must really be nice If the tourist are willing to put there life on the line.